Not long after Acer released its Aspire nettop powered by Intel Atom 230 suitable for average consumers’ usage, now seems that Gateway is ready to continue its momentum by offering a rebranded version based on Aspire targeted for higher end market. 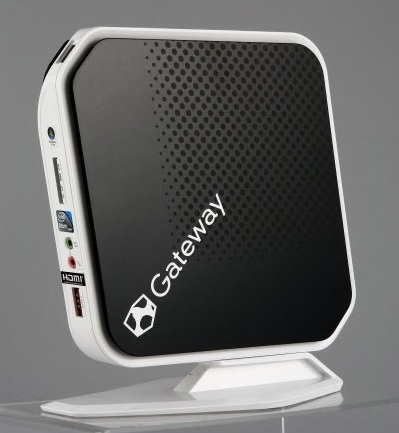 Just recently, Gateway has introduced a new version, named as QX2800 that is powered with Intel Atom N330 duo-core processor while still pairing with powerful Nvidia Ion 9400M graphics chipset. Although both of them looks similar (except with white and black color), there are some improvements being made to the Gateway QX2800 especially in the hardware specification to handle much intensive applications. The most significant one is obviously the change from single core to duo-core Intel Atom processor support with the QX2800 powered by Intel Atom duo-core series N330 clocking at 1.6GHz. Besides, the hard disk space has been tripled from originally 160GB to 500GB so that it can be differentiated better tailored for user groups that need higher performance and memory capacity. Other than these, both of them still stick back to Nvidia’s Ion chipset, which is sufficient enough in offering a significant graphics decode capability improvement as compared to Intel native chipsets such as US15W or 945GSE chipsets. Other unchanged specifications include the 2GB memory RAM, a similar 802.11b/g/n wireless module besides other peripheral interfaces such as HDMI output, USB 2.0 ports and etc. No pricing information yet, but since the hardware specifications have been upgraded and not to surprise that the selling price will be much higher than Acer Aspire model. The QX2800 will be preloaded with Windows Vista Home Premium suitable for all users.